In the wake of Tuesday’s terrorist attack near the Blue Mosque in Istanbul, Crystal Cruises has decided to cancel their calls at Istanbul and Kusadasi. In the attack, a suicide bomber killed 10 and injured more than a dozen in an area teaming with tourists. The canceled calls in Turkey will be replaced with calls in Greece. 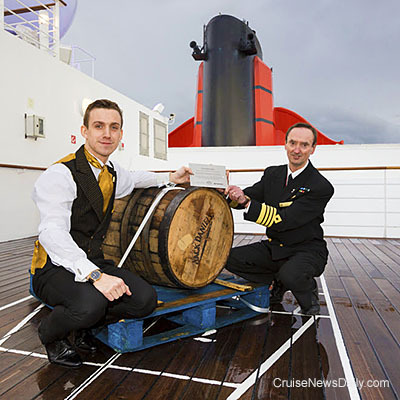 The complete story appeared in the January 15 edition of Cruise News Daily. Meyer Turku began the float out today of Mein Schiff 5 for TUI Cruises at their Turku (Finland) yard amid a snow storm and freezing temperatures. TUI Cruises is the German-based line that is a partnership between German travel company, TUI travel and Royal Caribbean Cruises. Ferdinand Strohmeier, VP of Operations for TUI Cruises, and Dr. Jan Meyer, the president of Meyer Turku, opened the valve that began flooding the drydock with some 300 million liters of water. Despite the 10-degree temperature (-12 Celsius), the water flowed, and once the dry dock is filled tomorrow, the 99,000-ton ship will be towed upstream to the outfitting pier where it will be finished over the next six months. Details appeared in the January 15 edition of Cruise News Daily. Carnival Cruise Line said today they would be giving Carnival Inspiration a multi-million-dollar makeover during its upcoming dry dock and adding a number of the line’s latest dining and bar features to the 70,000-ton ship. It does carry a bigger message, however. The complete story appeared in the January 14 edition of Cruise News Daily. Royal Caribbean said that twenty-one passengers from Independence of the Seas were aboard a tour bus in Jamaican today when it was involved in a traffic accident. One of the passengers died in the four-vehicle crash, and three others were taken to the hospital with injuries. Details appeared in the January 14 edition of Cruise News Daily. The father of an 11-year-old girl was in Broward County court yesterday accused of helping the girl’s uncle assault a 13-year-old boy who had offered the girl a key chain for her virginity. The incident occurred aboard Royal Caribbean’s Independence of the Seas last August 13. Carnival Corp declared a quarterly 30-cent-per-share dividend today. It will be paid on March 11 to shareholders of record at the close of business on February 19. MIAMI, January 14, 2016 — Carnival Corporation & plc (NYSE/LSE: CCL; NYSE: CUK), the world's largest travel and leisure company, today announced that Roger Chen has been appointed chairman in China, effective January 1, 2016. A native of China, Chen will be based in Shanghai and lead all government relations and port development, while also supporting the company’s joint ventures in China. In this new role, Chen will have responsibility for representing all of Carnival Corporation’s brands in China to continue growing the company’s industry-leading presence and scale in the region. Chen will report directly to Alan Buckelew, chief operations officer for Carnival Corporation, who relocated to Shanghai in 2014 to oversee operations in China. Buckelew will continue to provide strategic leadership to drive the company’s long-term growth plans in Asia. Michael Ungerer, recently named chief operations officer-shared services for Carnival Asia, continues in his strategic role to support growth across the brands in Asia, reporting to Michael Thamm, CEO of Costa Group, with a dotted-line to Chen. As a veteran leader in China, Chen’s background includes strong expertise in corporate and government affairs, and in-depth knowledge of the Chinese government’s policies and operations. Chen’s experience includes several senior positions where he led strategic efforts in China for major multi-national corporations, including General Electric, Microsoft, Volvo Group and Alcatel. Most recently, Chen served as China president for Volvo Group, representing the company’s interests across all business groups in China. With the appointments of Roger Chen and Michael Ungerer, Carnival Corporation continues to bolster its Asia leadership team, which already includes veteran brand leaders Buhdy Bok, president of Costa Asia and Anthony Kaufman, executive vice president, international operations for Princess Cruises. Among their overall responsibilities, Bok and Kaufman oversee operations in China for their respective brands, which currently anchor Carnival Corporation’s market-leading presence in China with four total ships. In 2016, Costa and Princess will again expand with each brand adding a ship to its fleet in China, representing a 58 percent increase in capacity in China in 2016, and making Carnival Corporation the first global cruise company with six total ships based in China later this year. Additionally, the company has announced plans to operate two additional cruise brands in China in 2017. Carnival Cruise Line and AIDA Cruises will join Costa Cruises and Princess Cruises in the Chinese market in 2017, making Carnival Corporation the first company to operate four cruise brands in China. In December, the company announced it will build two new 135,500-ton ships with Italian-shipbuilder Fincantieri S.p.A. for Costa Asia for deployment in China by 2020. One of the features of Holland America’s new Koningsdam will be a greatly expanded Culinary Arts Center. This will be so big that not only do they have a show kitchen, but in the evenings they will be serving dinner there. You have dinner and the show of watching the chef prepare your dinner. Each course will be fresh, prepared just before it is served to you. It will also be farm-to-table fresh, because some of it will be grown right in the Culinary Arts Center. The complete story appeared in the January 13 edition of Cruise News Daily. 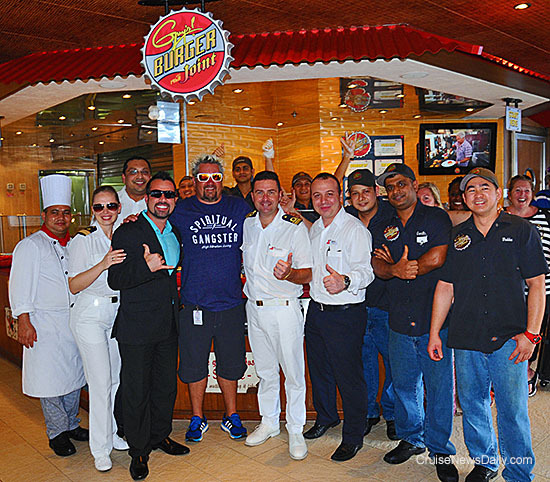 TV chef Guy Fieri stopped in to visit his namesake burger joint - Guy’s Burger Joint - aboard Carnival Liberty when it was in St. Maarten. While aboard, he went behind the counter to give the staff some tips on making burgers. But everybody seems to like them just as they are, because they serve up to 1,000 a day on the ship. Carnival Liberty was the first of Carnival’s ships to add a GBJ, which the line developed with Fieri, in 2011. The popular poolside restaurant is now on eight Carnival ships and will be aboard Carnival Vista when it debuts in May. Guy Fieri at Guy's Burger Joint aboard Carnival Liberty. Norwegian Cruise Line told travel agents today their new western Caribbean private island in Belize, called Harvest Caye, would again face another major delay in opening. They now set the opening date at mid-November 2016, some 13 months later than the original plan. The latest opening date had been set for February 16. The Port of New Orleans had more than a million passengers pass through it for the fifth consecutive year. People in Celebrity’s new advertising campaign are unwittingly playing a game of Marco Polo. The ones who answer the call of Marco Polo are answering the call of modern luxury, and the home of modern luxury, according to the line, is Celebrity Cruises. Either you get it or you don’t. Take a look at Celebrity’s latest television spot below. Those who are calling are calling like-minded Celebrity travelers. Will You Be Able to Remember the Age of Discovery? If you order an Age of Discovery cocktail, and the bartender says they have just run out and he’ll have to make some more, be prepared to wait awhile. The very limited edition cocktail is the joint production of Cunard, the Savoy Hotel and Jack Daniel’s. It will be aged in a 300-liter Jack Daniel’s barrel. How long? That’s the most unique part. the latest cargo to join Queen Mary 2 on Sunday, Jan. 10, 2016..
P&O Australia Cruises’ new 55,820-ton Pacific Eden made her maiden call on her namesake port, Eden (NSW), on Sunday morning. 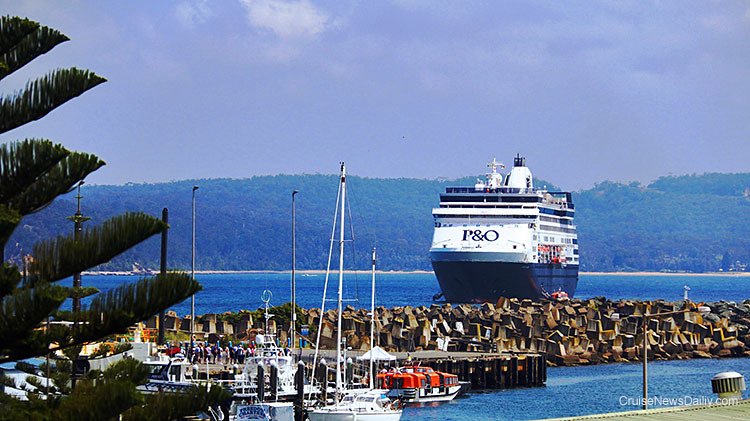 “Pacific Eden is a beautiful ship and Eden is a beautiful coastal town – this maiden visit was a match made in heaven,” said P&O Australia president Sture Myrmell. You can see why they call it Eden in the photo below.